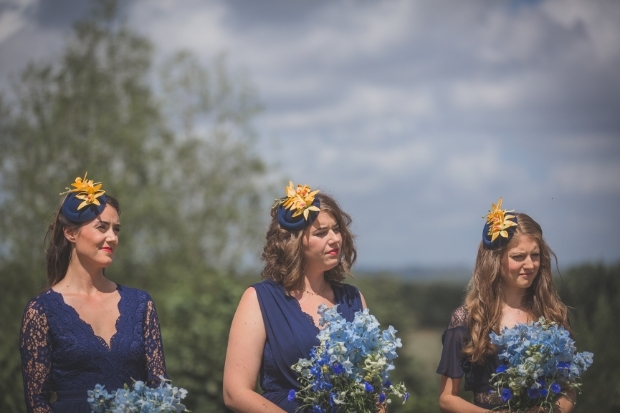 Jordan and David celebrated in style with their truly international, vintage yellow and blue-themed nuptials. Jordan Ramsey, Canadian by birth, met Sussex lad David Roche whilst they were studying for their PhDs at Cambridge. 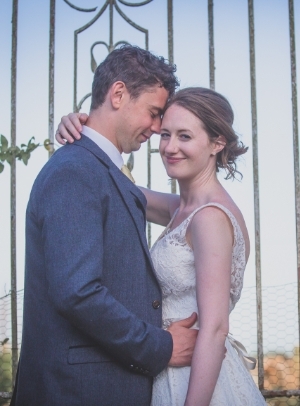 Fast forward six years, and the couple had planned a trip around scenic Wales, where David surprised Jordan by romantically proposing on a day out to the beautiful Snowdon. 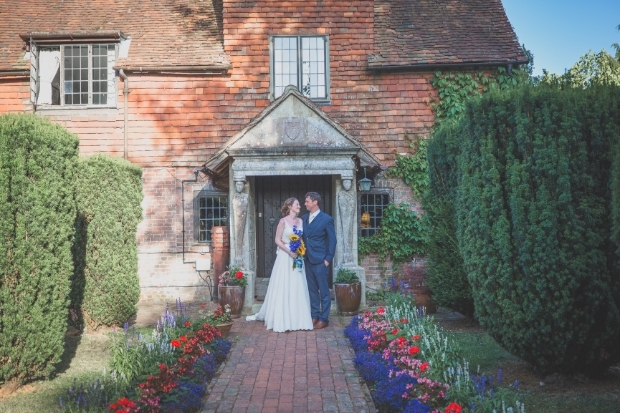 The venue hunt was on, and Pekes Manor fit the bill perfectly for the pair. 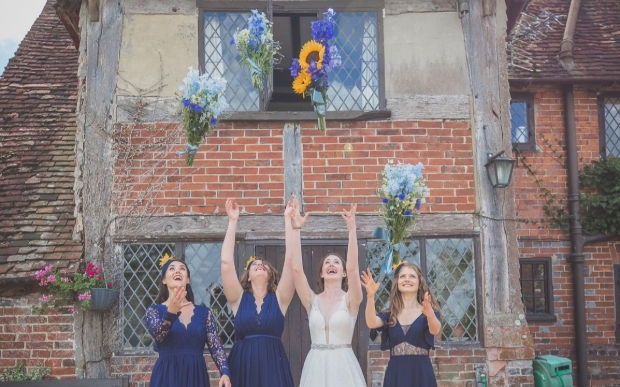 Jordan says: “It's a beautiful and quirky venue, just like us! 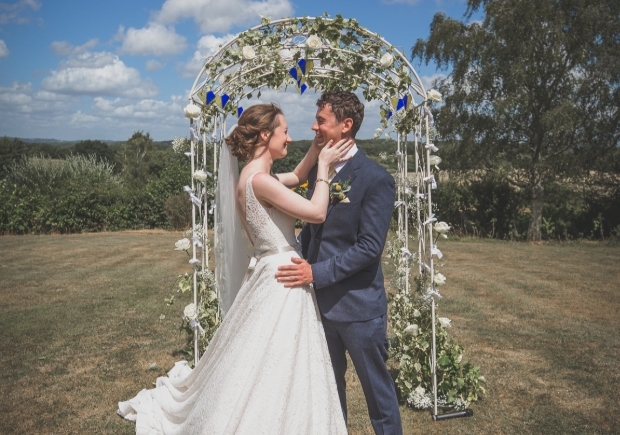 It totally suited our style.” The nearlyweds found the venue to be flexible, allowing them to create the wedding of their dreams. “And we could have our family and friends to stay for the weekend,” Jordan explains. 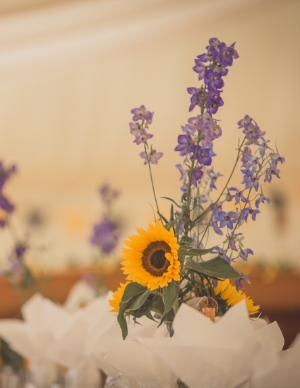 The centerpieces were floral arrangements made by my uncle. Each one was slightly different and incorporated driftwood from my hometown in northern Canada. 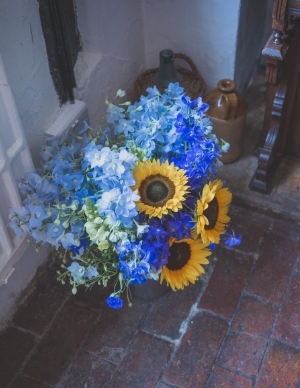 Sunflowers, delphiniums and cornflowers tied the floral arrangements in with our yellow and blue theme. The groomsmen wore thistles as buttonholes. 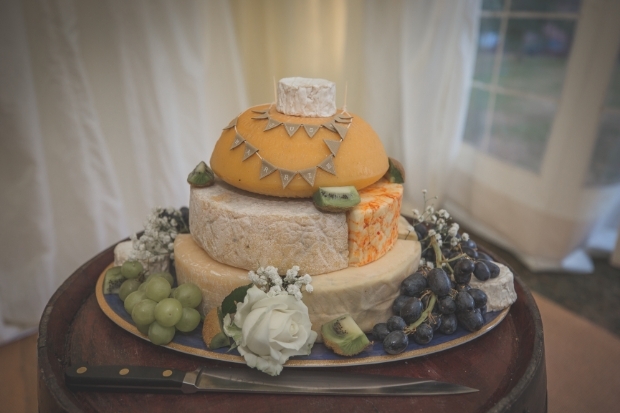 We didn't want a cake cake, so we had one made entirely of cheese! Wheels of different varieties from the local High Weald Dairy were placed on top of each other and decorated with fruit by Dave's mum. We served it after dinner as an evening snack. We found photos of our friends and families for place names and set them in small pieces of wood. The tables were all named after cities or towns we had lived in. My dress was by Canadian designer Mikaella. 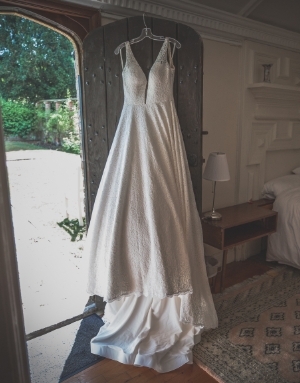 A sleeveless lace ballgown with long train, I felt it had an elegant English country manor style with a touch of Canada. The beautiful arch we held our ceremony under was decorated in roses and gypsum by Dave's mum. 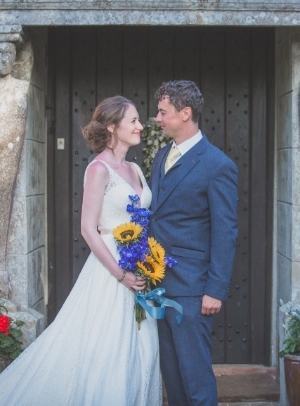 It also boasted handmade blue and yellow-stained glass hearts – again made by Dave's very clever mum! We had a ceilidh with a local live band to start the evening. It was a great way to get everyone involved. The band finished up their set with a Canadian-led line dance. 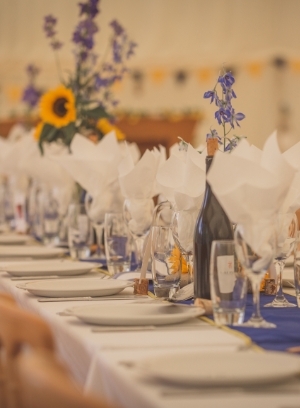 For the reception, we laid out long trestle tables, just like the ones they had for the formal dinners we had back at Churchill College, where we met. 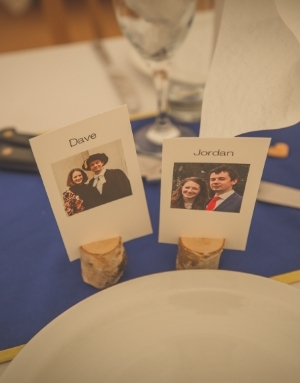 The tables had blue and yellow table-runners made by Dave's parents. 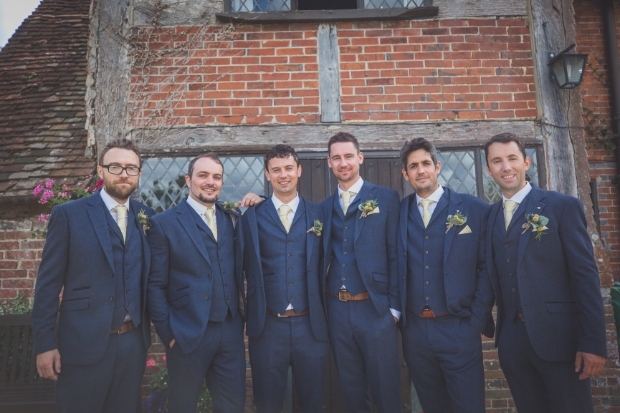 The groom, best man and groomsmen all wore blue tweed three-piece suits from Cavani and yellow ties. 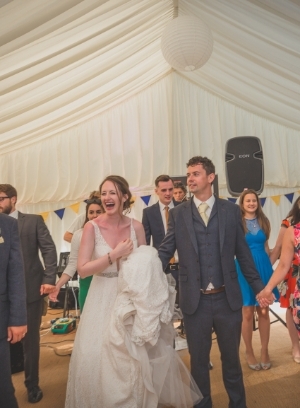 Without realising, this was almost exactly the same outfit his dad wore for his wedding! I let the bridesmaids choose their own gowns. Navy, flowing and floor-length were the only directions I gave them. Each has a different body type and taste, so I thought it best for them to make their own choices. We danced the night away with a silent disco. We each created a playlist. Dave stuck with classic 80's tunes, and I chose country music and a lot of pop! We had a lot of skeptics initially, but everyone was dancing and singing along in the end. Our guests came over from Canada, Singapore, France, Montenegro, South Africa and Australia –all over! It was so touching to have people travel so far to share our day. We felt surprisingly relaxed on the day. In the morning, David and the groomsmen even managed to spend time drinking champagne in a hot tub! Our photographer did an excellent job, giving us time to chat with guests, enjoy the occasion and be relaxed. Following the wedding, we spent the remainder of the week exploring parts of Sussex and Kent with some of the Canadians who made the trip over to the UK. We'll be honeymooning in Japan in 2019.